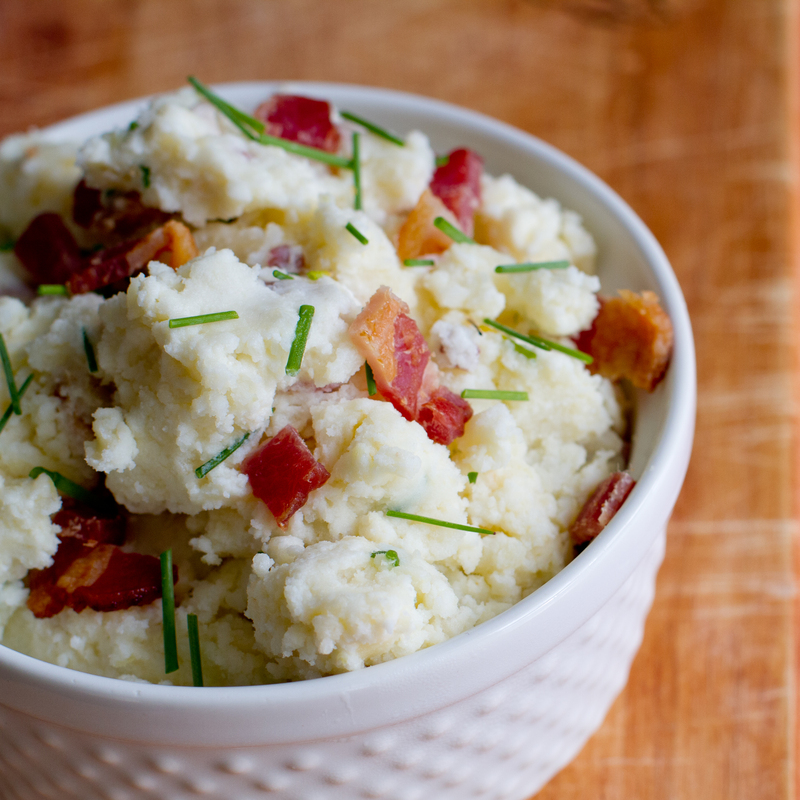 #ad Loaded Mashed Potatoes and We're Going to a Potluck! Not only will there be fantastic speakers, like Jeni Bauer of Jeni’s Splendid Ice Cream, Joe Yonan, Food Travel Editor of The Washington Post and cookbook author, and Jessamyn W. Rodriguez of Hot Bread Kitchen, but I’ll also get to meet fellow bloggers whom I’ve only known online thus far. As I have jokingly been telling my husband, my imaginary friends are about to become real. Yay! In honor of the occasion–and because they’re one of the sponsors of the event–OXO sent out 1 of 3 different kits to all attendees to play around with before the big weekend: Baker, Cook, and Cocktail Maker. Each was filled with wonderful tools of the trade–it was up to us which we would receive. While normally I would identify myself as a Baker, I actually had those items in my arsenal already. So I went for the #OxoCook gadgets, which included a 3-in-1 adjustable potato ricer and a zester. I love new kitchen toys! 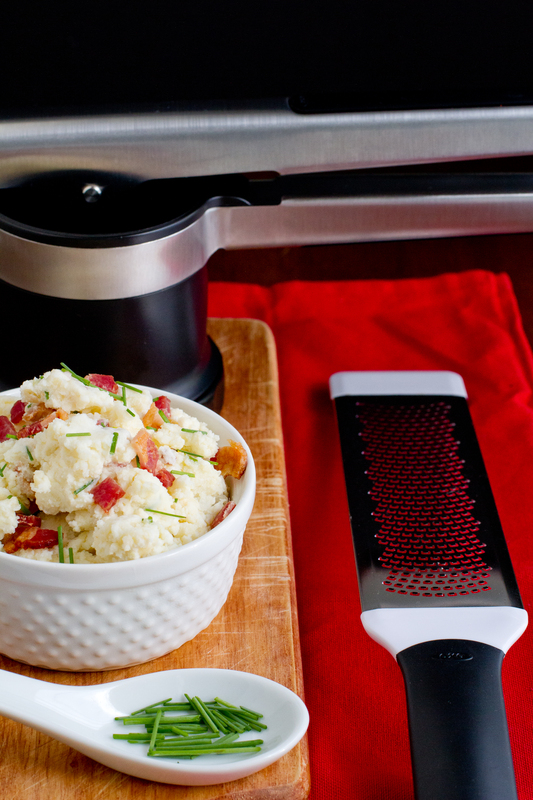 The potato ricer can be used for so much more than potatoes, but I wanted potatoes, so that’s what I made. Loaded Mashed Potatoes. Why not go a bit over the top, right? 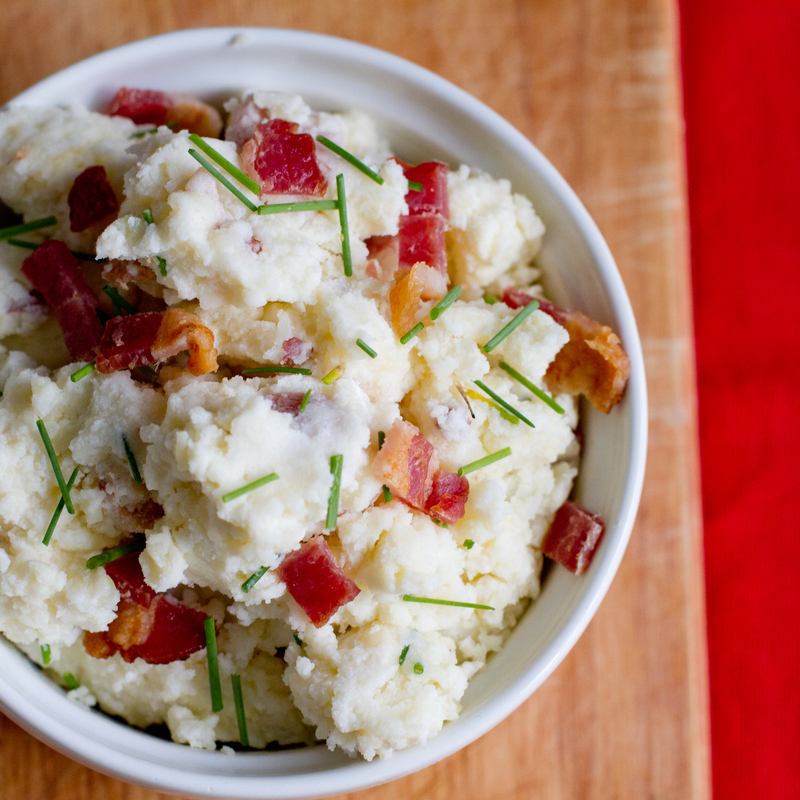 Filled with cream cheese, Kerrygold Dubliner cheese, sour cream, Kerrygold salted butter, bacon, and chives, these are more of a meal than a side dish. Hearty and filling, they won’t disappoint. And they reheat beautifully–in fact, I almost preferred them the day after. Not a bad way to break in a new tool! You may not hear much from me Friday through Sunday, but I’ll be taking lots of photos and notes to share with you upon my return. At least I left you with some comfort food in my absence! Cover with water, add a few pinches of sea salt, and boil until tender. 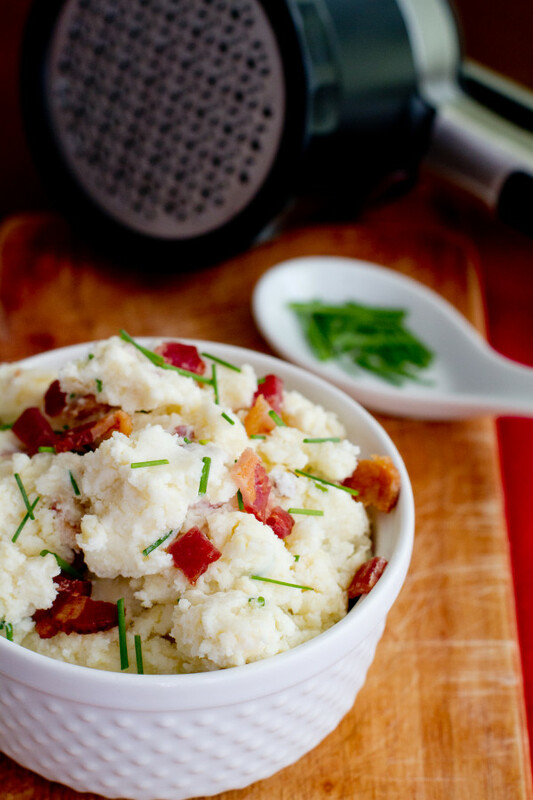 In the meantime, set out the rest of your ingredients so you're ready to go when the potatoes are done (grate the cheese, cook and crumble/chop your bacon, etc.). Drain the potatoes and toss them into the OXO Potato Ricer, several at a time, pushing through the other end over a large bowl. Most of the peels will be removed in the process, but the potatoes will keep pushing through past them. 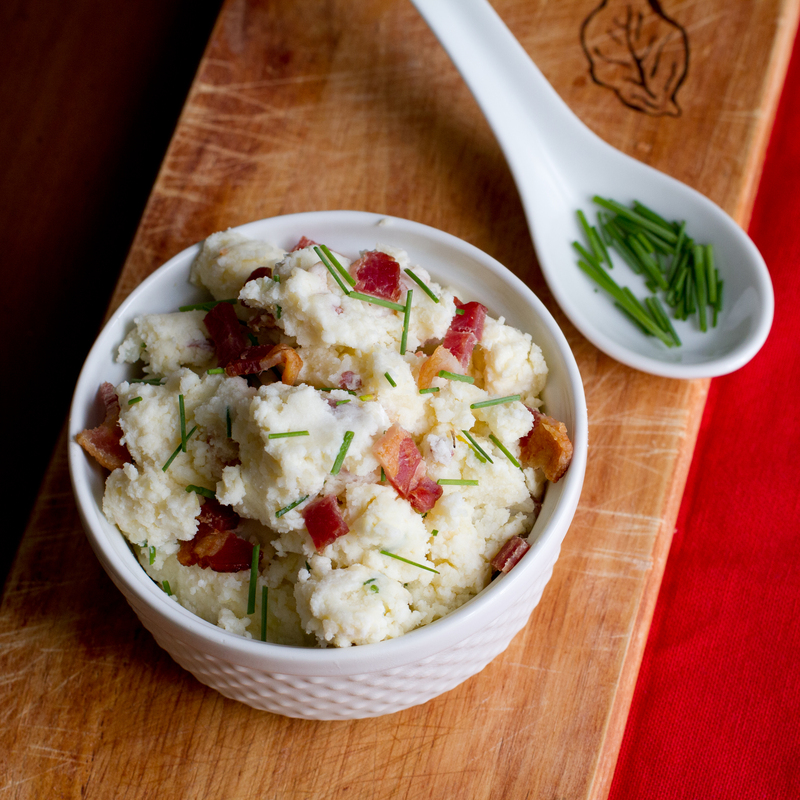 Once all the potatoes have been riced, add the rest of the ingredients and stir gently--you don't want to overdo it. Serve immediately or refrigerate to save for later, reheating in the oven at 350 degrees for 20 minutes or so. I want to go to a blogger conference! It’s my goal for next year 🙂 Have fun! Do it! This one sells out fast, so I missed out a couple times because of that. I’m nervous but really excited to go!